Alex joined the Better Start Innovation Hub in January 2016 with over 20 years’ experience working in the field of informatics, gained in a variety of settings, including the pharmaceutical industry, the NHS, Cancer Research UK (CRUK) and academia, with a stint at the Psycho-Oncology Group (now SHORE-C) at the University of Sussex and thirteen years at the University of Leeds and the CR-UK Leeds Centre, where he published widely on cancer informatics and web technologies. 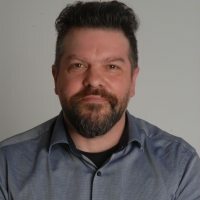 During his time at Leeds, Alex was one of the key members of the pioneering Patient Pathway Manager (PPM) team, developing the system for research and patient benefit, and was also instrumental in devising and championing web tools and technologies for use in cancer and health research, including the capture, management and analysis of patient reported outcome measures (PROMs). Alex provides informatics and systems development expertise to the Better Start Bradford Innovation Hub and, as part of the Born in Bradford Data Team, also contributes expertise to other research programmes and initiatives undertaken by the Bradford Institute for Health Research and its collaborators. Knowing that what I do during the course of my working day will contribute to positive outcomes for the people of the Bradford district and beyond.